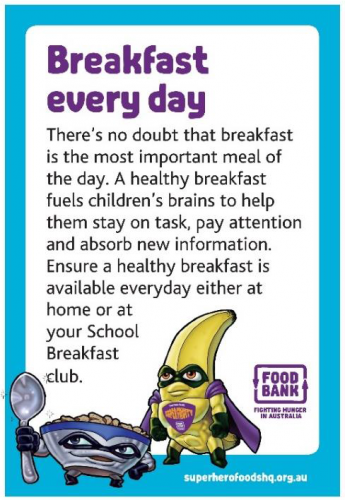 Each morning before school our enrolled students can enjoy breakfast at our Breakfast Club. This operates out of the school’s community centre and commences at 8.15am. Parents are also welcome to drop in for a hot drink when they drop their children off at school. Breakfast will not be served after 8.30am. Our school chaplain oversees the program and it is run on a roster basis by staff and community volunteers. Our student leaders also assist with the program. The menu consists of toast with spread, cereal with fruit and milk, and a warm Milo. A high standard of behaviour is expected from students who attend the program. The program is supported by Foodbank WA as well as donations from local businesses.